Like automobile manufacturers, there are many manufacturers of bronze grave markers. The first step in ordering your bronze death date scroll is to determine which bronze memorial manufacturer made it. This may be difficult as some monument dealers who sold the bronze memorial are no longer in business or the cemetery may not have records of who manufactured it. Not to worry. 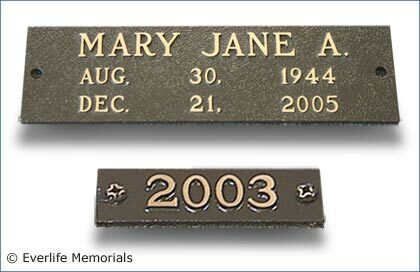 We'll help you find the right manufacturer for the bronze memorial and issue a quote to you for the bronze date scroll. NOTE: Although this may seem like a tedious process it is necessary to ensure you get the exact bronze death date scroll for your loved one's bronze memorial. Before photographing the bronze grave marker and date of death scroll, make sure the area to be photographed is fairly clean. It is also best to ensure there is plenty of light to get a good photograph. Here are a couple of sample photographs of a bronze grave marker and a close up of the bronze date of death scroll. 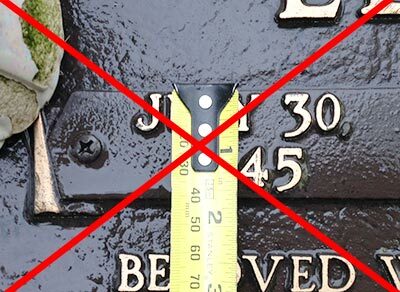 Again, please don't submit photos with a ruler/tape measure laid over the scroll. There are 2 types of scrolls. The first is a Split Scroll where only the date of death will be needed. The second is a Standard Scroll whereas the name, date of birth and date of death are cast on the scroll. Many standard scrolls have odd shapes and are not a perfect rectangles. It is important to measure to the widest points on the scroll. We will need the following measurements. When you have all the information collected, please send it in an email by clicking on the link below. We'll research which bronze manufacturer makes the bronze date of death scroll and give you a quote. Also include your name and contact information such as a phone number and email. Send the above information to support@everlifememorials.com or by clicking on the button below. Once we receive this information we'll research which manufacturer makes the bronze date scroll and issue a quote to you. Please understand that we can identify the bronze manufacturer and provide a quote most of the time. However, there are instances when we cannot identify the manufacturer due to the fact that they may no longer be in business.